In the 1930s, Nancy Sandars travelled with friends in Italy, France, Germany, Austria, Malta and Spain. Nancy did not keep a diary, but wrote long letters home to her family most of which they have preserved and many are archived on this website. She visited Rome when it was a provincial town surrounded by gardens. Her visit to France included a very cold Paris and a rather beautiful Normandy where she stayed in a chateau and a farm. Nancy's sister, Betty, who was studying at Lady Margaret Hall, University of Oxford, introduced her to 'Die Klause' in the Rhineland where those reading history went to learn German. Die Klause became a favourite place to stay, and was where Nancy, besides studying German, learned much about music and benefitted from the presence of Karl Ebert in Darmstadt as the conductor of music there before being forced to leave Germany and carry on his work at Glynbourne. Her visit to Austria in 1934 coincided with the rising of the Social Democrats there and there was much fighting. Nancy was joined by her mother in Vienna and as soon as they could escape, they went to Budapest and then returned home. The rising was soon followed by the Anchluss. Her mother died in June 1934 from a short illness. In 1936, she travelled with a friend to Spain, just before the start of the Spanish Civil War and witnessed the trouble that was unfolding. In 1936 Nancy returned to Britain. 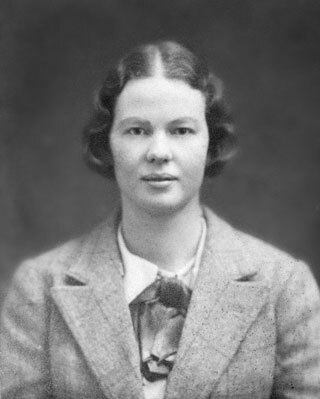 Her sister, Betty, who was at Oxford University, introduced her to the archeologist Kathleen Kenyon, who encouraged Nancy to take up archaeology, which she did, under the guidance of Kenyon and Mortimer Wheeler. She joined an excavation with Kathleen Kenyon in 1939 at The Wrekin, a hill in Shropshire where an Iron Age settlement, a round barrow with Iron Age hillforts, had been discovered. Kenyon's dig involved the ramparts of the hillfort on the summit. Nancy was also planning to join Mortimer Wheeler on a dig in Normandy later in 1939, but the impending war in Europe intervened. Instead, she responded to an urgent 'SOS' message from Kathleen Kenyon to help pack up the artefacts on display at the Institute of Archaeology in London so they could be moved to safety from bombing. Nancy recalls how she was asked to throw fragile pots down some stairs into the hands of Kathleen Kenyon below - a task they performed with great accuracy as none of the precious artefacts was broken.